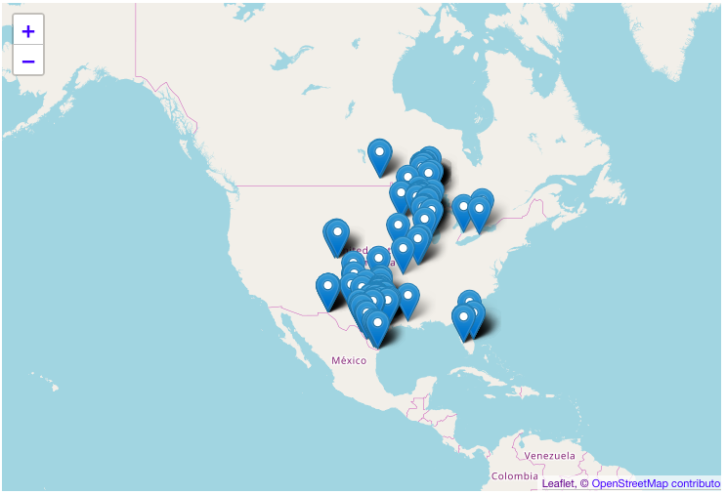 When you take a whole month off of work, in my case almost all of July and you travel like I do, you’re bound to cover a lot of ground and have a lot to talk about. That’s why it’s mid September and I’m just finishing up talking about it. When everything was said and done, my trip consisted of over 6,000 miles, 2 countries, 10 US States, and 2 Canadian provinces. This included going to a wedding, 2 music festivals in 2 different countries, hitting up every Great Lake, going to a wedding planning party, and attending my 10 year high school class reunion. Now a lot of people will ask me how I pulled off taking almost a whole month off. They know I’m not a teacher who gets a summer break and the realities of the modern work environment typically doesn’t allow something like this. The main thing is, I work in the public sector. Unlike most IT jobs, I am not exempt (aka salaried with no overtime). If I work over 40 hours, I will get overtime. Instead of them paying me out at 1.5 times my hourly salary, they pay me out in comp time (basically paid time off) at 1.5 times. Essentially, if I work 1 hour of overtime, I get 1.5 hours of time off. 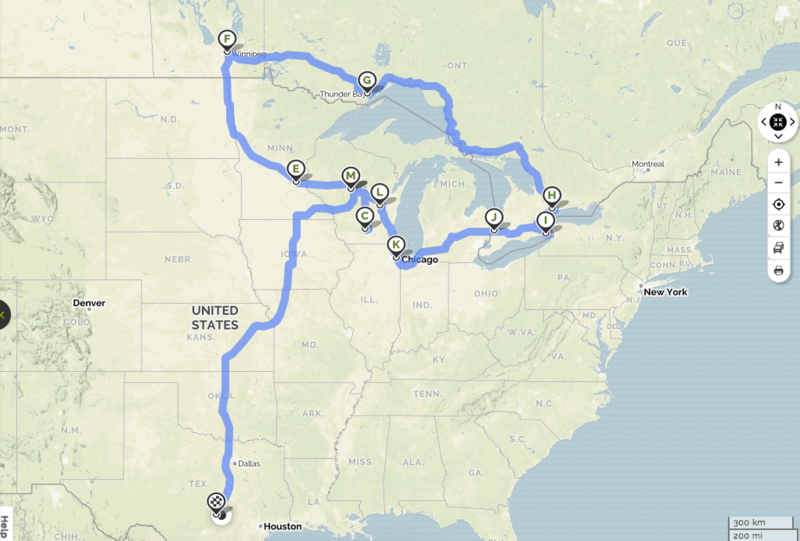 If you’ve read this blog for any amount of time, you can see I do a ton of traveling for work. While I am told to limit overtime and, for the most part, my planning is pretty dead on, working more than 40 hours is inevitable, especially when you do things like scale the whole Texas-Mexico border. Even if I only get a couple hours of overtime a week, my projects often last for weeks, if not months. This 1-2 (or often much more if I’m told to work more to get something done) hours each week adds up fast over time. When the amount of time gets to a certain level, the Comptroller starts to alert management. This means, in many cases to get off their list of people with a high amount of comp time, I actually need to take an extended amount of time off to get my balance down. Now you might think this is absolutely insane and ask yourself where you can sign up. I will admit that, compared to the average worker, I do make good money. While I do make good money compared to the average person, within my industry I’m severely underpaid compared to what I would make in the private sector. By severely underpaid, I mean I am leaving $20-30,000 a year on the table doing the same job for a private company. I’m probably making half of what I could be if I applied my MBA to some sort of private sector job. Now speaking from an MBA perspective, I’m foregoing a lot of money for freedom. It’s really all about trade offs and there fact I do get to travel for work (something I enjoy), and also because I accrue a lot of comp time and get to travel on my own time (which I enjoy even more). The job I have pays the bills and enables much of the lifestyle that I desire. Effectively, I’m working to live and not living to work like I may be in another job that pays much better, but doesn’t give me the freedom I have with this job. The trade offs have thus far balanced out. I had planned this trip out for a while and when the time came, Victoria rode with me up to Wisconsin. We attended a wedding and explored Marshfield the next day after the wedding. The day after, we headed to Madison and Stevens Point. Since Victoria didn’t have the vacation I do, she needed to fly back to Austin. We drove to Minneapolis and spent the 4th of July at a hotel there. On July 5th, we woke up early and I took Victoria to the airport to fly back to Austin. I then headed up to Winnipeg and did a little exploring. On July 6th, I drove from Winnipeg to Thunder Bay and got some insane gas mileage. I then spent the next few days hitting up Thunder Bay hard, as well as attending Bluesfest. 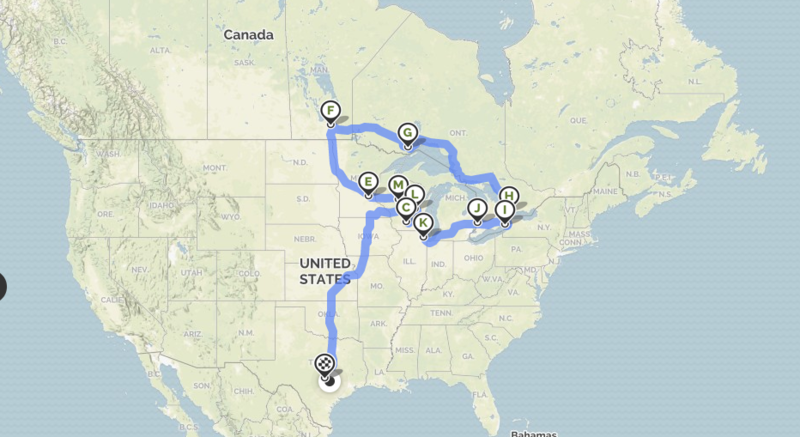 On July 10th, I decided to say goodbye to Thunder Bay and drive to Toronto. I made it to Sudbury before I slept at a rest stop. The next day I was able to go through Toronto and hit up 3 Great Lakes: Lake Ontario, Lake Erie, and Lake Huron. I then made it to a rest stop in Michigan for the night. On July 12th, I drove from Michigan to Oshkosh. I hit up Lake Michigan along the way and then drove through some flooding in Kenosha. I made it just in time to meet at my friend Kevin’s house so we could get provisions for RockUSA and then spend 3 days there. After RockUSA, I headed back to Marshfield. I spent the following week relaxing there and also was able to drive my Cougar around a bit. Later in the week I attended a wedding planning party in Wausau and then my 10 year high school class reunion. Before I knew it, the month had passed and I needed to head back to Austin. I did this over 2 days and then spent July 25th as a final day to rest and get organized. Besides relaxing, there was a lot of work to do considering I had a month’s worth of stuff to blog about and also a whole lot of dash cam videos to process. The following are some of the local products that I found on my travels or just products I found interesting and unique that I brought back to try. I just saw this at the Metro in Thunder Bay and thought what the heck. 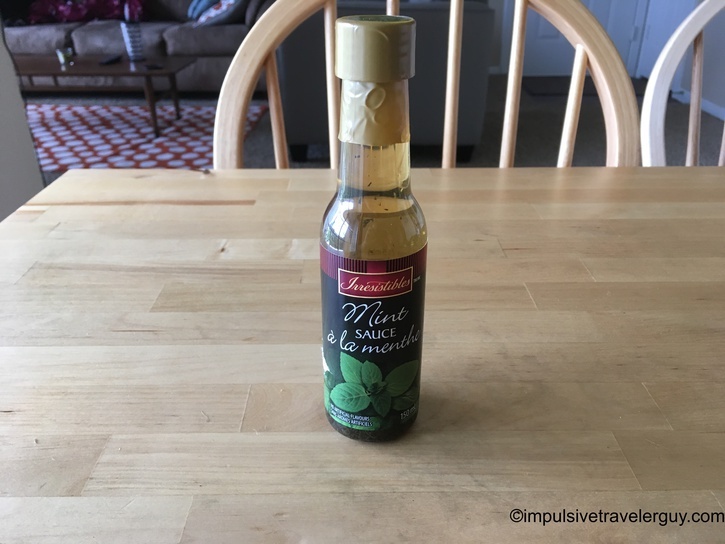 I have never heard of mint sauce, so I thought it might be interesting to try. I expected it to be sweet, but it has a strong vinegar taste and tastes more like a vinaigrette. I’ve yet to figure out what this might be good on, but the taste was definitely much different than what I thought. Surprisingly, I think it would make a good salad dressing. I’ve come to love this hot sauce! 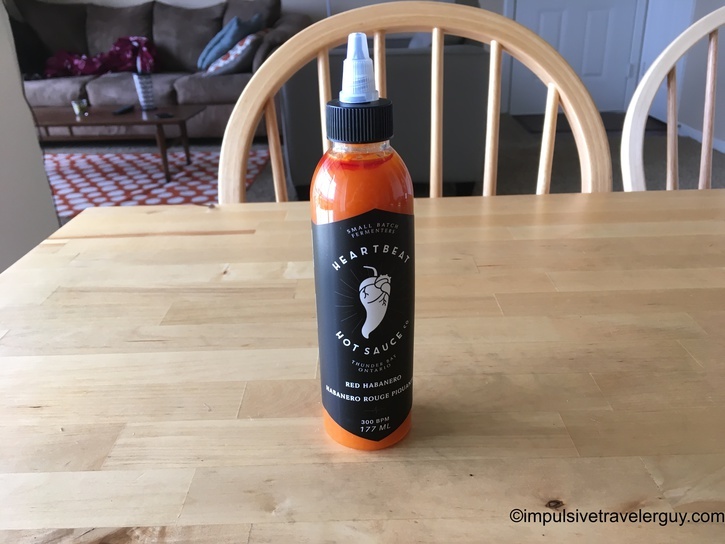 This sauce hails from Thunder Bay and I first tried it at Eatlocal Pizza. It was a match made in heaven! I then proceeded to buy a bottle at Maltese Grocery. 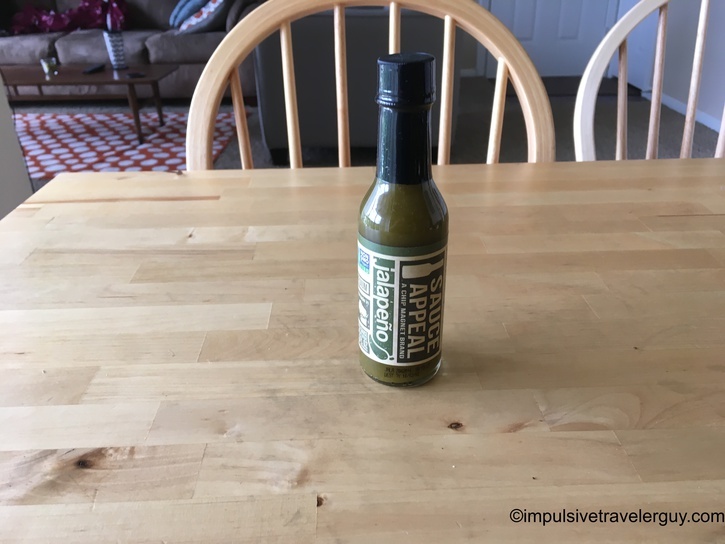 This stuff definitely packs a kick, but I love the tangy taste it adds to food. 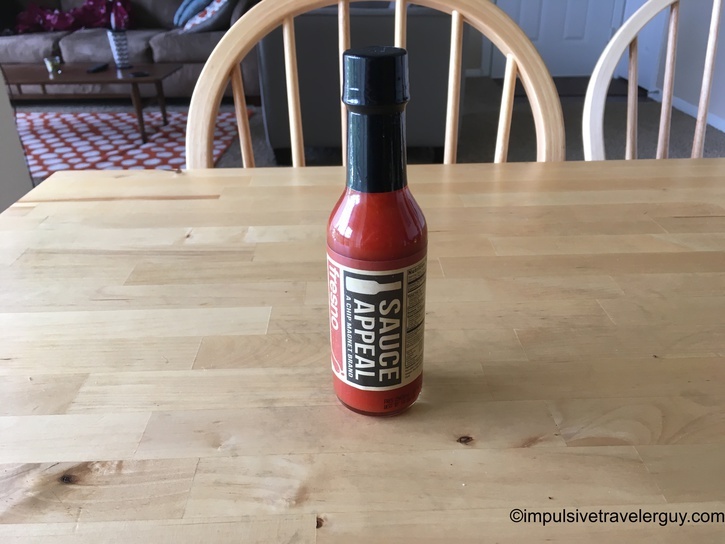 For a hot sauce on the hotter side, this is definitely a go to sauce for me. I would say this is one of the hottest hot sauces out of the Northern US\Canada I have found so far. If you want a good kick, this has one! I’ll probably stock up on this next time I’m in Thunder Bay. 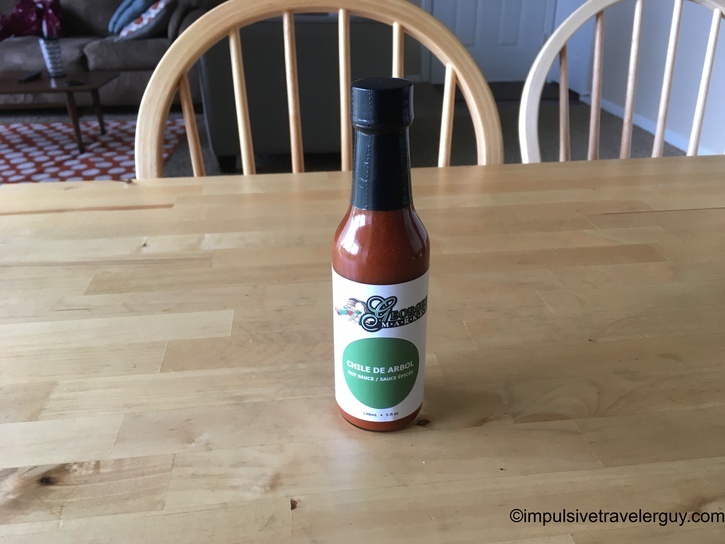 These hot sauces hail out of Madison, WI. I got them from Woodman’s. Overall, these hot sauces are sweet. I’ve found they’re good on tacos, especially black bean tacos. I could also see these going well on Wisconsin style BBQ (aka sloppy joe’s). This hot sauce works well if you’re looking for something sweeter. Both of these sauces hail from Eau Claire, Wisconsin. I bought them at Festival Foods. Overall, they aren’t very spicy but they do have a lot of depth to them. The jalapeño sauce seemed to have more flavor to it and I liked it more than the fresco. 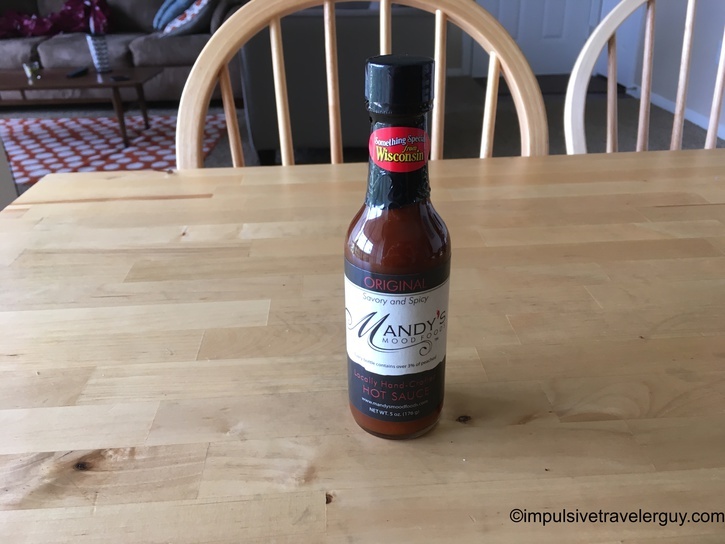 This is a good hot sauce if you’re looking for something that doesn’t have a lot of kick, but does add a lot of flavor. This hot sauce is the private label for George’s Market in Thunder Bay, Ontario. 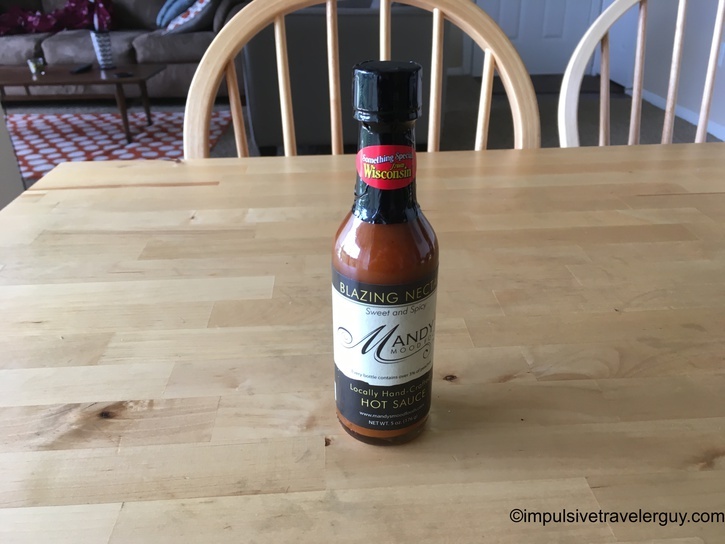 This hot sauce has a strong vinegar taste to it and tastes more like a spicy salad dressing than a hot sauce. I personally did not care for it, but I’m sure it might work good in some sort of marinade or something that a lot of vinegar would add flavor to. It’s just a matter of finding its niche. I know George’s Market has several more to try, so I’ll maybe check it out next time I’m up there and see if I can find a hot sauce I like more. I found this at Woodman’s in Madison. 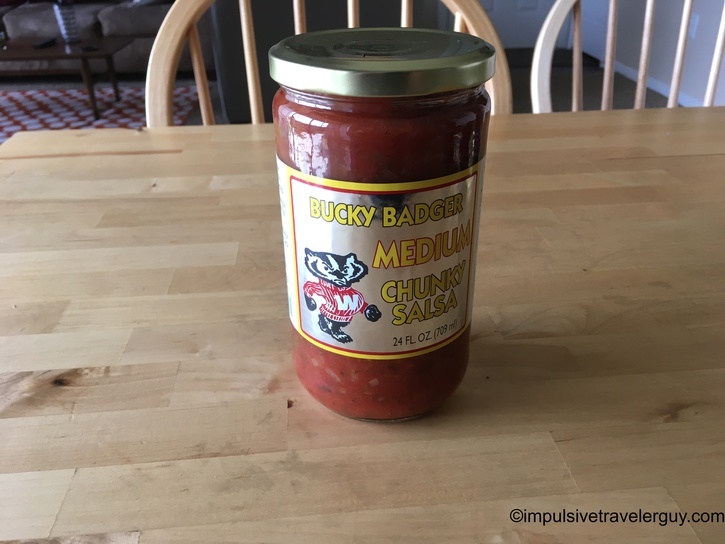 It is made by Wisconsin Select Foods in Verona, Wisconsin. Medium is definitely and overstatement for the spiciness of this salsa. There’s really no actual spice to this salsa (or maybe my taste buds have adjusted living in Texas). It is very chunky and actually sweet tasting. It’s so chunky you have to watch it or you’ll break your chip while dipping it. With that being said, I’d expect something like this out of the Midwest and eating this salsa reminded me of home. 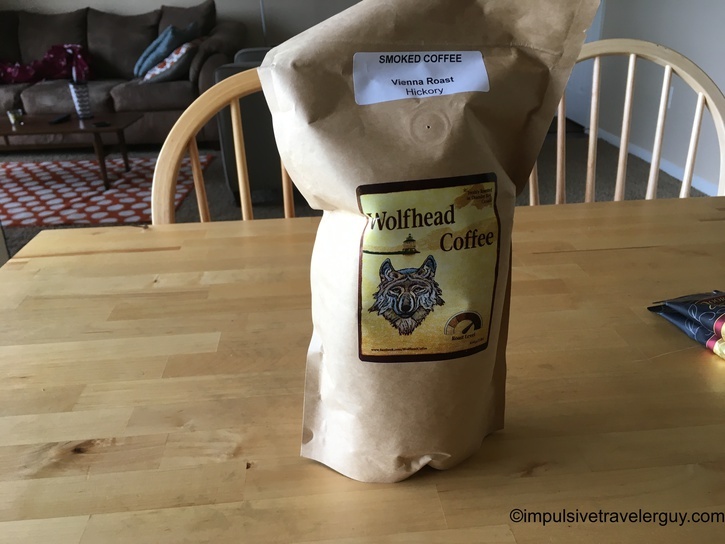 Wolfhead Coffee is from Thunder Bay, Ontario. I actually got the privilege to tour them and take a behind the scenes look. I have never actually seen smoked coffee, so this is a first. Overall, this coffee is definitely of high quality and much better than the typical more mass-produced stuff I’ve grown accustomed to. I know Wolfhead Coffee wants people to break their morning boring routine and this definitely did. I drank it up fast! I’ll have to buy some more when I’m back in Thunder Bay. One cool product I found at Woodman’s in Madison was a bunch of sampler one-pot packs of Door County Coffee & Tea Company coffee. This company is based out of Sturgeon Bay, Wisconsin. I found most of the coffee was really good from here. There were a few flavors I didn’t care for, but overall I did find some really great flavors to I liked. One thing I really enjoyed about this coffee was the small packs that allowed me to try a lot of different flavors so I got so sample every single one of their offers.. 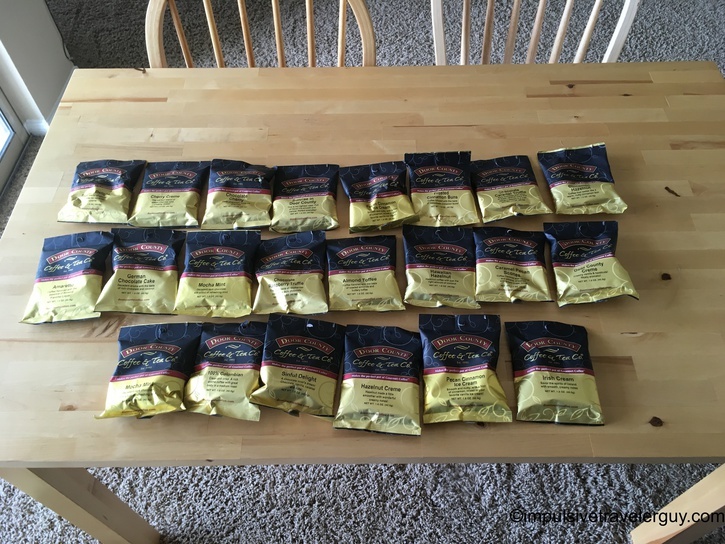 I do wish the packs were slightly bigger to accommodate my 12 cup pot, but I worked around that and did find a few flavors I might buy when I’m back in Wisconsin. 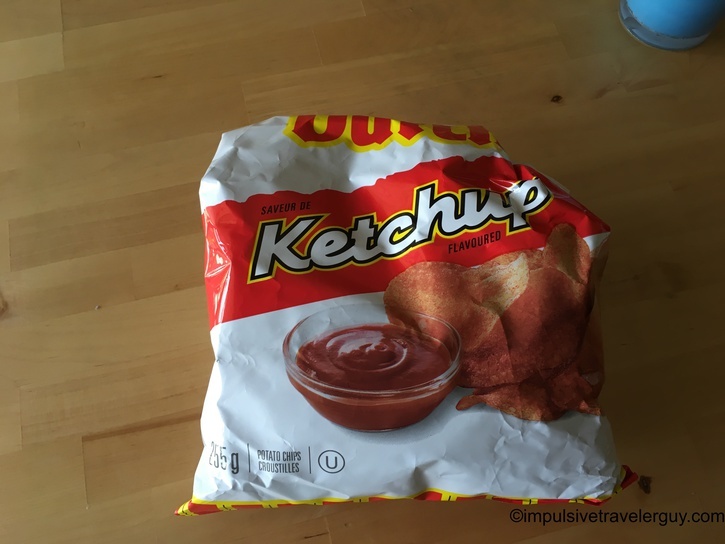 I also got some ketchup chips when I was in Thunder Bay. I think I’ve seen a few places start to sell them in Texas, but it’s kind of a delicacy for around here. I usually buy a bag or two and bring them back every time I’m in Canada. Being able to take a whole month off and cover the ground I did was awesome! I was able to see and do a lot of things. I’m not sure when I’ll be able to do this again in the near future, but it is something I’m hoping I can do in the future. In the meantime, I guess I’ll have whatever travel work has for me and also local stuff around Austin.